I got notices of copyright infringements for posting book front covers on my Picase album...? I have several Picasa albums. One [...] was pictures of the front covers of the books in my collection. [That] was mostly for reference because I would get asked a lot where the stuff I was stitching came from. I had the publisher info and everything in the caption for easy reference. Then one day, I started getting notices of possible copyright infringement. It was very frustrating because they just removed the images and I couldn't tell what had supposedly violated copyright. Nothing from the interior of the books was posted, just the cover. As I was combing through the album trying to figure out what happened, I stumbled across some comments from people asking for patterns. Really? I deleted those and then posted notices that I don't share patterns. But I kept getting notices and finally I decided to just delete the whole album because it was more trouble than it was worth. It did make me feel victimized even though I'm 80% sure I didn't do anything wrong. If it is not clear whether the album owner is using the images for illegal reference (ie: the copied design is on another service) or whether there is clear evidence from comments by users that "sharing" of the designs is taking place via e-mail, the images will be removed. It is of course possible that the user has no illegal intentions, but some designers prefer to reduce distribution of their images in a radical manner. As you pointed out, many infringers thought you may be sharing those designs. If they thought you may, it seems quite natural that copyright owners should come to the same conclusion. I think you did very well to keep refusing to share and to delete your album. Copyright - a perfect illustration by Linen Flowers. It's Friday at the office. Better known as "pay day." A day when you pay the mortgage or rent, get your groceries, catch up on bills. The clock ticks and still no check. Something must be wrong and it's almost time to leave. Wait. . . . . here comes the boss. The look on her face says something isn't right. "I'm sorry everyone. We don't have checks for you this week. Someone has stolen them," she says. "What? How can that be? We've worked for two weeks to get that money! It's ours and we're owed it! We have bills to pay and groceries to buy." "Oh well," she says. "Just keep working and maybe we can pay you next week. In the meantime, keep up the good work." **Downloading illegal cross stitch charts from the internet is the same as having a paycheck stolen for a designer. Before you download that chart, ask yourself how you would feel if the above story was about you and your paycheck. 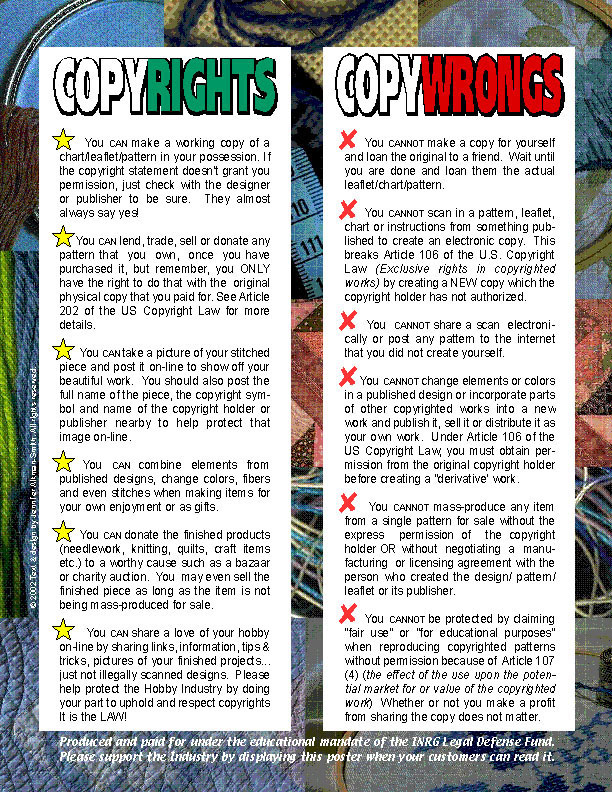 Copying needlework designs is NOT Fair use!